On October 20, 2018, millions of Afghans voted in the first parliamentary election since 2010, electing members to the Wolesi Jirga, or House of the People. Parliamentary term limits are currently set at five years, meaning that under ideal circumstances an election would have taken place at some point in 2015. However, a myriad of issues plagued the process leading to not one, but two postponements. High among these issues were the obvious security concerns with conducting an election in a war-torn country. 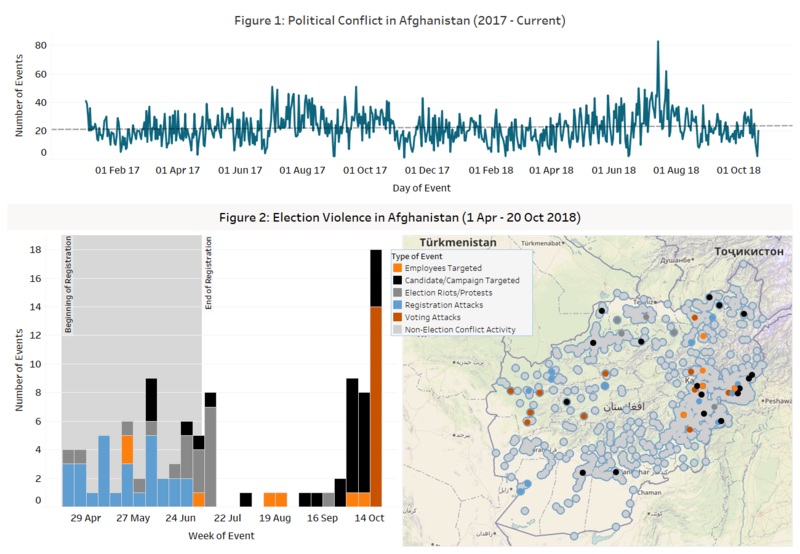 It cannot be said that a general reduction in violence has helped this election to succeed; as Figure 1 (below) demonstrates, the insurgency in Afghanistan is as strong as ever. Militant groups such as the Taliban and Islamic State (Khorasan Province) have consistently made statements condemning the election, which they deem to be illegitimate. Compounding the problem were issues with electoral reform, allegations of corruption and fraud, and the institution of new technology, all of which made it more difficult for people to register and vote with confidence. Despite this, approximately 9 million people registered out of the possible 12 million, and election officials reported a turnout of approximately 45 percent on voting day (Anadolu Agency, 21 Oct 2018). As a result of the delays, it appears that the Afghan government was able to better prepare itself for the challenges of both voter registration and Election Day. High fatality attacks related to the election have occurred since registration began in April 2018, but were relatively rare – totalling 13 events reported with 10 or more fatalities over the 7 month period. This is likely due to increased security; however, an apparent decrease in IS-claimed attacks during the final stage of the election is notable. In the end, reports of long lines at voting centres, despite technical difficulties and the threat of violence, reveal that the people’s desire for democracy is perhaps the greatest factor in the success of this election. This most recent election cycle can be broken down into two periods: the voter registration period, and the campaigning/voting period (as seen in Figure 2, above). The former begins in earnest in mid-April 2018, and although a few protests occurred earlier in 2017 both demanding that an election take place and condemning a proposal to add nationality and ethnicity to the new Electronic ID cards, a proposal that was later scrapped (Embedded Security News, 16 Feb 2018). The Afghan government had been attempting to make the voting process easier through a series of electoral reforms, although a lack of progress over a lengthy period of time was noted by the UN and caused them to end their election support funding in 2015 (Reuters, 12 June 2015). Despite this, by April of 2018, the registration process had begun. As mentioned earlier, both IS and Taliban had condemned the election, believing it to be the result of Western influence (Washington Post, 8 Oct 2018). Attacks from both groups on voter registration centres are numerous during this period and are concentrated in areas with often high militant activity. The largest of these attacks was an IS suicide attack near a registration centre in Kabul on April 22, where 69 people were reportedly killed (Pajhwok, 22 April 2018). In addition, protests continued throughout the registration process, highlighting problems with the new systems such as the ID cards and the use of biometric data. Demonstrating the presence of political tensions as well, large-scale demonstrations also occurred to demand the return of exiled former VP Abdul Rashid Dostrum, threatening to boycott the election otherwise (Reuters, 15 July 2018). Despite a rocky start, the Independent Election Commission (IEC) reported that just under 9 million people had registered by July 6 (IEC; 2018). This appears to be a generally good outcome, all things considered; however, results differed depending on the province. In Ghazni, only 9 percent of the eligible population registered, due in part to recent Taliban incursions, as well as ongoing Hazara protests against the division of constituencies in the province. On the other hand, Paktia province reportedly registered 141 percent of its eligible population (Afghanistan Analysts Network; 28 Aug 2018). Following the end of registration on July 6, there is a lull in protest and militant activity related to the election. This picks up again significantly in late September in the form of attacks on parliamentary candidates and their supporters, as well as on election officials. Oddly, only one election-related attack was claimed by IS during the past few months. As earlier described, the group was significantly more active during the period between April and July, with over 100 deaths being reported during IS attacks against voters, candidates, and election officials. However, it cannot be said with certainty that many of the unclaimed attacks during the campaigning/voting period were not perpetrated by the group. The October 20 suicide attack outside a voting station in Kabul has yet to be claimed and fits the modus operandi of IS. It remains to be seen whether the group’s foothold in Afghanistan is holding strong. Earlier in August 2018, it was reported that 150 IS fighters surrendered following clashes with Taliban in Jowzjan province (Telegraph, 1 Aug 2018). Later in the month, the group’s leader was reportedly killed by a US airstrike (CNN, 3 Sept 2018). Lately, the group has reportedly been clashing with members of Lashkar-e-Islam as well in Nangarhar province (ITCT; 9 Oct 2018). Meanwhile, Taliban attacks surged on voting day itself, particularly targeting voting centres. 71,000 security personnel were reportedly deployed throughout the country to protect these locations (The Diplomat, 21 Oct 2018). In certain areas, staff trained to use the new biometric systems did not show up for work out of fear, and when they did there was often still difficulty with the untested process (Time, 20 Oct 2018). However, demonstrating the people’s determination, long lines were reported across the country and voting was only postponed in two provinces: Kandahar and Ghazni. In the former, the vote was delayed following the Taliban killing of the provincial police chief a few days before; in Ghazni, the vote was postponed as a result of heavy Taliban operations (The Guardian, 19 Oct 2018). With results likely expected sometime in December, the election in Afghanistan is being hailed as a success for the nation’s democracy despite the technical chaos and violent objection by certain groups. Earlier in the year, President Ghani had offered the Taliban a chance at political legitimacy should they seek peace (VOA; 28 Feb 2018). While Taliban leadership chose to ignore the deal at the time, perhaps this popular rejection of the group in favour of democracy will push them towards ending the conflict.